Hyderabadi Biryani this dish most famous in Hyderabad. Most of the food lovers like to eat Biryani it is available so many restaurants. 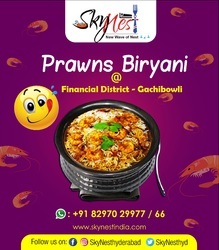 But tasty Hyderabadi Biryani in Gachibowli made by SkyNest. They prepared with hygienic ingredient and it provides yummy and spicy. So don’t late. Book Now in Zomato. Hurry up soon.